Your student will learn exciting new concepts, including the jobs of Silent E, new phonograms, and methods for decoding multisyllable words – and continue to establish a firm foundation for a lifetime of learning. Every component of reading is taught: decoding (phonics and structural analysis), vocabulary, fluency, and comprehension. Below is a sampling in each area. 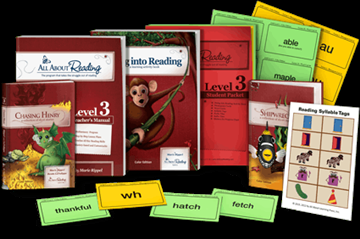 Please note: In addition to the Level 2 Materials, you will also need to choose either the Basic or Deluxe Reading Interactive Kit. The Interactive Kit contains non-consumable items that are used throughout the entire All About Reading program.